Statue of Fido. Borgo San Lorenzo, Tuscany. Why are dogs named Fido? A doggy historian may well answer that it's because Abraham Lincoln named his favorite pet dog Fido. Wrong! - real dog lovers know that Romans named dogs Fido because it means 'I trust' in Latin. So here's our story about a dog named Fido who was really really faithful. Please read this story to your dog between his bedtimes. investigated and found an injured puppy. He brought him home and nursed him back to health. They became fast friends and the young dog followed him everywhere, so he named him Fido. He was a mixed breed, and generally looked like a hound. He was mostly white with some black patches, and his nose was always at work. As good dogs will do, he followed Carlo everywhere, including to the bus stop in the town square where Carlo took the early morning bus to work. Fido would hang around the square until Soriani returned on the evening bus where he was greeted with the unfettered joy that only a dog can muster. This went on for two years and became a well-known ritual in the square. On December 30, 1943, the factories of Borgo San Lorenzo were bombed by the Allies, and Carlo Soriani was killed. Fido met the bus that day, of course, but the joy of greeting his master would never come again. Eventually Fido returned home to the Soriani home and Carlo's wife, but the next afternoon Fido again returned to meet the evening bus, and was again disappointed by every departing passenger. He returned the next day, and the next week, the next month, the next year, and the next decade. Fido met Carlo Soriano's evening bus every day for the next 14 years – more than 5,000 days. Fido means faithful, 100 percent. Slowly, the story of Fido became known beyond the town square. In 1953, the local correspondent of La Nazione, a national Italian newspaper, wrote a story about Fido which plucked Italian heart strings, and the story was picked up throughout Europe. 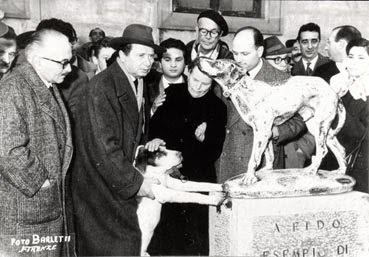 In 1957, a ceramic statue of Fido was erected in Fido's honor, but it was soon destroyed by vandals ( in Italian stories: 'soliti imbecilli' - the usual imbeciles). The town then commissioned the bronze statue by Salvatore Cipolla that we see today. The sculptor, the mayor, Fido, and Soriani's widow, 1957. The mayor of Borgo also bestowed honors. Fido was granted the right to circulate without a muzzle as well as something all Italian dogs and citizens dream of: a lifetime tax exemption. In November, 1957, Fido was awarded a gold medal in a ceremony at City Hall. The story ran in newpapers in Paris, Amsterdam, and Tokyo. Fido passed away in June of 1958, alone on a rural road. Appropriately, he was buried just outside the cemetery where Carlo Soriani is buried. The news was reported around Europe and with a four column headline in La Nazione. PIPPO Fido is not our only faithful Italian dog story. In the town of Torre del Lago, also in Tuscany, there's another dog statute we wrote about. This dog was also hurt, and Pippo taught the town's human beings a thing or two about life. Read it here: Torre del Lago / Philosophy with a Bite. Fido lived in The Mugello region of Tuscany - northeast of Florence, which is especially well suited to car touring. The website Mugello Tourism has lots of information and suggested itineraries such as Medici castles and a wine trail. There are lots of agriturismi available (farm B&B's), as well as other accommodations in friendly small towns. Don't miss the ancient bishop's palace at Scarperia, or the cute town of Vicchio near the birthplace of Giotto. Borgo San Lorenzo is an excellent little city that makes a good base for exploring the Mugello region. Located here is the Chini Museum, a must-see for all artists and designers interested in the decorative arts. Galileo Chini was a very influential designer advancing Italy's Liberty Style - a beautiful and unique hybrid related to Art Nouveau. You can also see the style in the Mayor's Room at the Town Hall (Stanza del Sindaco) and several other locations around town including in the Romanesque Church of San Lorenzo which also has a Madonna by Giotto. And look for the Fido statue - absolutely every person in town over 6 months of age can point the way.